Successive Myanmar governments have been introducing policies to repress the Rohingya since the 1960s, according to Burmese Rohingya Organisation UK (Brouk). They argue that Rohingyas are not a genuine ethnic group but Bengali migrants who represent a divisive leftover from colonial times. They are denied basic services and their movements are severely restricted. The oppression of the Rohingyas has gradually intensified since the process of reforms introduced by President Thein Sein in 2011, Brouk says. 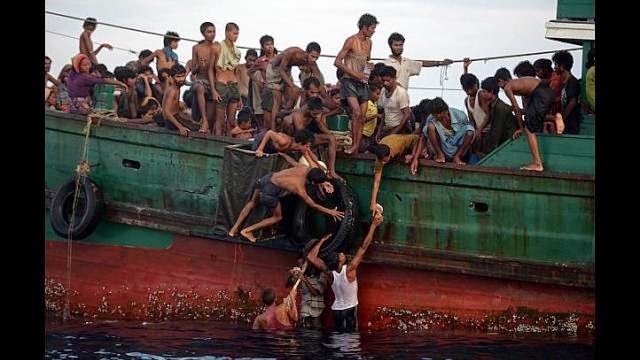 In June and October 2012 there were large scale attacks on Rohingyas in Rakhine State. In addition, in March, the government revoked white cards - or "temporary registration certificates" - that had been issued to hundreds of thousands of Rohingyas. This meant that they no longer have the right to vote in the upcoming elections in November. BROUK President Tun Khin was invited to the BBC studio in London and he said “President Thein Sein government is trying to get the whole Rohingya minority to get out of Burma. Burmese government is doing genocidal acts against Rohingyas by denying rights to work, rights to move, rights to access education and most recently rights to vote. The government is pushing Rohingyas to the camps and denying access to aid, giving them two options live in camps or leave from Burma." As a Priority, Tun Khin mentioned “Firstly Thailand, Malaysia and Indonesia have to immediately stop pushing boats and have to send out their navies to find the remaining boats and provide them with humanitarian assistance”. He strongly urged that "The UN, EU, OIC, US and UK have to cooperate with ASEAN countries to address the root cause of the problem, which is to stop persecution against Rohingyas in Burma. For the International community, stronger action is urgently needed to protect the Rohingyas of Burma. We really need immediate action from international community to save our people."